Miracles occur when passions are fulfilled. One such passion, with the power to change the world for the better, is blogging. So, if you have always wanted to start a Successful blog and something was holding you back every single time you thought to make a move, it’s time to gear up and follow your dream to start a blog. But how to go about it the right way? With a plethora of information that is rampant all over the internet, your mind is bound to get puzzled. It seems daunting but all you need to do is be precise and work step by step. To get you started down the right path with a brand new blog, you need a few of these free (and affordable) tools & resources. We’ll be using them throughout this guide to speed up your progress. You can check whether your website name is available on Bluehost below. Any newbie tends to incline towards the monetization of a blog and how to mint money from it. Do you really think that should be the first step? Instead of focusing on what will earn you more money, ponder on what you have in-depth knowledge about. Remember, if you are going to share something with your users, you yourself should be an expert in it. Aspire for recognition and perfection before you start a blog. When you blog about the niche you are passionate about, you automatically share information that is relevant to the users. Your passion has earned you experience on the subject and is in a place to best portray it. As most experts say, content is king. If the content you share is appealing, you will have your own set of readers. Readers connecting with your content, looking out for more and someone whose time on the internet is now valued. The key to earning great revenue soon is all set. Now that you know your niche, look out for what your competitors are doing. If you are a passionate tech head, look at the top tech blogs that are gaining millions of visits in a short span of time. Carefully study the interface of their blog and determine their x-factor. It’s that wow factor which makes visitors go gaga over the blog. Now, this doesn’t mean that you should blindly replicate their entire process. But when you are starting from zero, it is nice to have a brief idea as to what is in demand in the present scenario. In fact, copying, plagiarizing or even line-to line paraphrasing is a strict no when it comes to establishing yourself and flourishing in the blogging industry. There are three popular blogging platforms that you can choose from, namely Blogger, Tumbler, and WordPress. Blogger can seem like a viable option from the point of view of beginners who consider ease of use as their top priority. Tumbler is a tactful blend of social networking and blogging. So, it can offer an interesting turn of events when you combine the two most powerful internet concepts. Now let us come to WordPress. I guess I was saving the best for the last! WordPress is functional, flexible, and one of the most popular blogging platforms so far and that too for a good reason. Unlike popular opinion, WordPress is easy to use if you focus on it while working. It has a wide array of options to choose from while deciding on the themes and customization options that will impart a professional look to your blog. The interface is user-friendly, and the platform makes it easier for your readers to share your content on the various social media platforms, thereby, increasing your blog traffic. Remember the importance of branding. The step is going to decide the sole Brand name your blog must live for. The most important step before blindly going for the first name that pops into your head is to explore the tone of your blog. Imagine what you seek to accomplish. Keep your niche in mind and that the name should reflect the message you are trying to convey and keep it unique. Also, consider who your target audience is going to be. For example, a beauty blog has much of female readers. So, the name should sound feminine and appeal to all women in general. Also, make sure that you list out multiple names for the first time. I will clear the reason behind this in the next step. So, now, you have a list of possible names to start a blog. All you must do is purchase the domain for the name you desire. The unique URL for your own website is known as the domain name and try to create it from blog name generator. For example, in google.com, google.com is said to be the domain. Bluehost is one of the most credible sources for domain and web host purchase. The reason we talked about having multiple options in the previous step is to find the availability of the domain in world-wide-web. There may be a chance the opted name that you have decided is already purchased by someone. In that case, you have got to have multiple options to choose from. Most people purchase their ideal domain after a few hit and trials along the way. Apart from the payment that you must make for buying the domain, there is a nominal domain fee that the platform charges per year. Remember to pay that on time or your site might get into a lot of trouble. Although most platforms send a reminder via mail before the renewal is due. In order to start a blog and make it live on the network, you require server space. A web hosting company is responsible for providing this space. Every hosting company offers you plans that you can select according to your own preferences and budget. Some also offer domain privacy with premium versions. Remember, WordPress is merely software that can let you have access to your blog on your own PC or local machine. For launching it out on the world of web and enable a wide range of viewers to view your content, a host is a must. There are multiple frameworks available in the market. If you use Blogger as your platform then there will be a limited number of themes available. 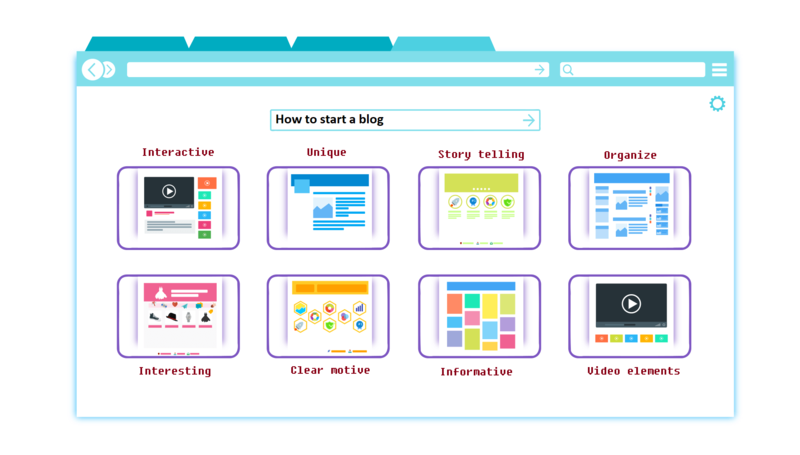 Blogger – It is good if you are a beginner and just learning to blog, but in the long run, you will feel like there are way too many limitations with this platform. As far as WordPress is concerned, there is a variety of themes, starting from the basics to the more professional ones. If you aspire to earn big bucks with your blog, then it is a wise move to invest in a paid theme that makes your blog look professional and aids in providing the ease of use to the users. With every theme comes a whole range of customization options which you can set according to your likes or your readers’ preferences. Just with a few clicks here and there, you can change the theme of your blog any time you want. Your blog should clearly represent the niche you have chosen, simultaneously giving the top priority to the convenience of the users. If your site is not easy to navigate, be mindful of the fact that your rivals are just a click away. We have so far gone through steps to start your own blog. As simple as it might sound, there are millions of blogs online and thousands getting added every day. While there is a race for excellence, your blog needs more than the basic flavour we spoke about. Billions of users across the globe are looking for interesting and meaningful content. Let’s look at ways we can take the blog to the next advanced level. After you are done finalizing the design of the site, it is time for your content to go live. But before straightaway diving into content writing abruptly, there are some factors you need to consider. Remember, the content speaks for itself. Your way of writing should be reader-friendly, and the viewers should think of it as friendly advice. Not like they are reading a newspaper. One of the best ways to eradicate all errors from a blog post is to proofread it as many times as required. There is many software available online such as Grammarly that will do the task for you. Your content should be visually appealing otherwise people will leave your site within seconds, thus, increasing the bounce rate. Include multimedia to keep the readers engaged for a longer duration. Well, to start a blog you are good with the steps mentioned earlier in the article, however, to untap the potential of your blog the sole criteria is the traffic from viewership. There are some proven strategies that you need to adapt to generate a large amount of traffic. First and foremost is sharing your blog post on all the social media platforms. Although be mindful as to not to spam. Relentless spamming will put off your readers and people might start blocking you from different places. Drop meaningful comments on other bloggers’ posts and be interactive in the process. Write blog posts with a call to action message to provoke the readers to share and respond. Keep the format of your post organized into headings, subheadings, and pointers to increase the readability. Once you have adopted these strategies, you must follow these for every single post that you publish to maintain high traffic. Now, all this might sound like a lot of effort in the beginning, but when you go about it the right way, all these tasks don’t seem like that big of a deal. So, let go off any hesitations that you have had in the past and gear up to make the move. With the simple steps put together, you are no longer away from your first blog. All the above-mentioned measures to start a blog, will not just launch your blog but take it to the intermediate level of blogging.